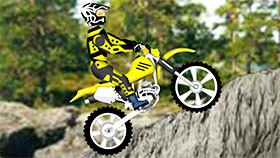 Moto X3M 3 is the third part of this extremely exciting terrain racing game The game was developed by Mad Puffers studio and allows players to play on flash web. 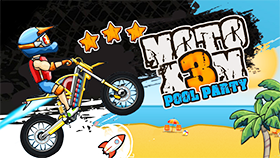 If in part 1 and part 2, you run on hot desert roads or icy cold lands, then in part 3, you will have to control the motorcycle and try to overcome the obstacles. obstacles on stages on an island. Obstacles are now a nightmare for players. You will see the giant wheels have no way to launching through it, you only can run up to its safe surface to overcome it, or you will have to keep up the correct time to run on complex terrain which is constantly moving, or you will have to be on time to take advantage of thrust from the explosive barrels to launch further. The player rating system is the same as the second part. When the player reaches the finish line, the system evaluates the players with the stars. There is a maximum of 3 stars per stage and each star will be a timeline, if the player arrives at that time slot will receive the star. 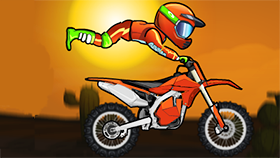 In addition to Flip and save points, the game has additional achievements to challenge players as well as the online leaderboard system to honor Top Players.